Elisha's servant (II Kings iv. 12 et seq. ; v. 20, 21, 25; viii. 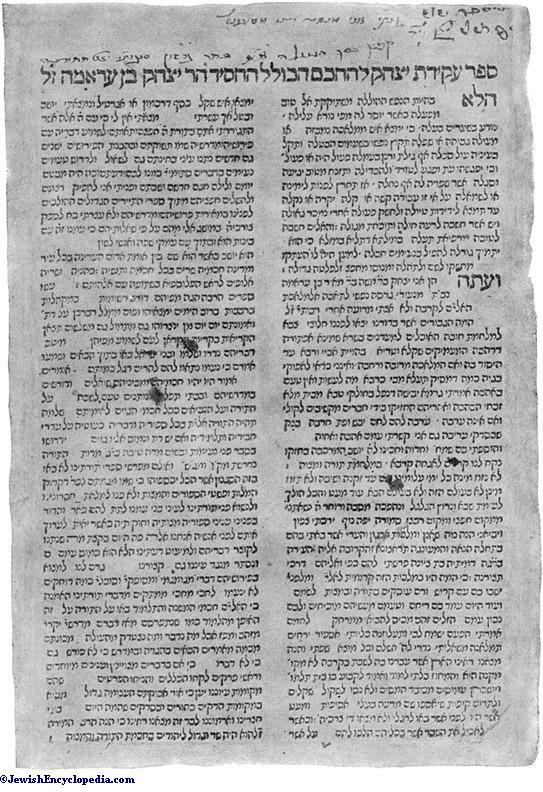 4-5). 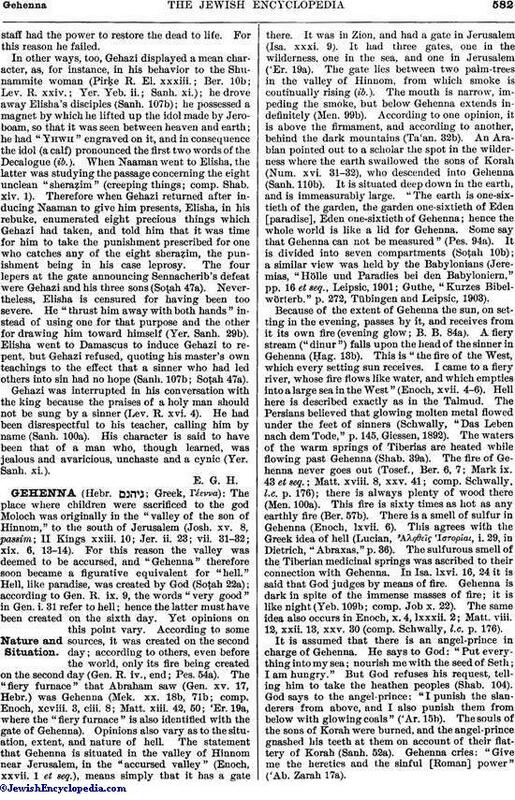 Gehazi is mentioned first in connection with the history of the woman from Shunem. He explains to the prophet her desire to have a son (ib. iv. 14). Later, when she visits Elisha at Carmel, beseeching his aid in behalf of the child that has died, Gehazi would rudely thrust her aside. Elisha, however, charges him to hurry to Shunem, saluting none on the way, and lay the prophet's staff on the child's face (ib. iv. 27-29). Though he does as he is bidden, he fails to recall the child to life. 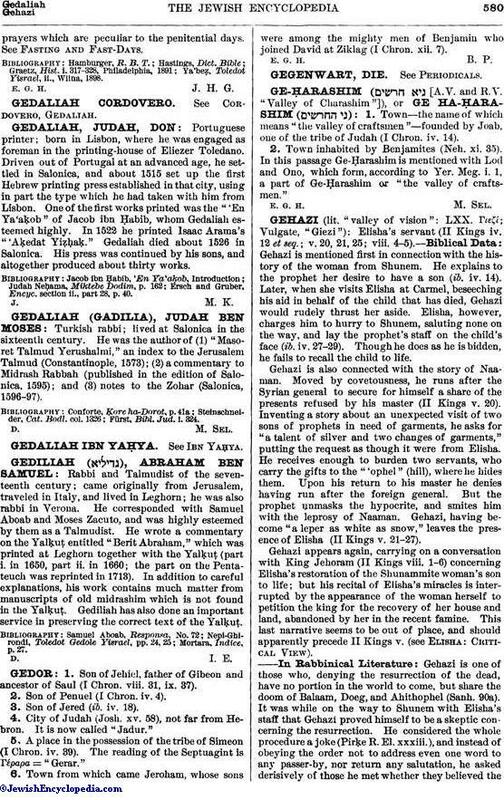 Gehazi is also connected with the story of Naaman. Moved by covetousness, he runs after the Syrian general to secure for himself a share of the presents refused by his master (II Kings v. 20). Inventing a story about an unexpected visit of two sons of prophets in need of garments, he asks for "a talent of silver and two changes of garments," putting the request as though it were from Elisha. He receives enough to burden two servants, who carry the gifts to the "'ophel" (hill), where he hides them. Upon his return to his master he denies having run after the foreign general. But the prophet unmasks the hypocrite, and smites him with the leprosy of Naaman. Gehazi, having become "a leper as white as snow," leaves the presence of Elisha (II Kings v. 21-27). Gehazi appears again, carrying on a conversation with King Jehorarn (II Kings viii. 1-6) concerning Elisha's restoration of the Shunammite woman's son to life; but his recital of Elisha's miracles is interrupted by the appearance of the woman herself to petition the king for the recovery of her house and land, abandoned by her in the recent famine. This last narrative seems to be out of place, and should apparently precede II Kings v. (see Elisha; Critical View). 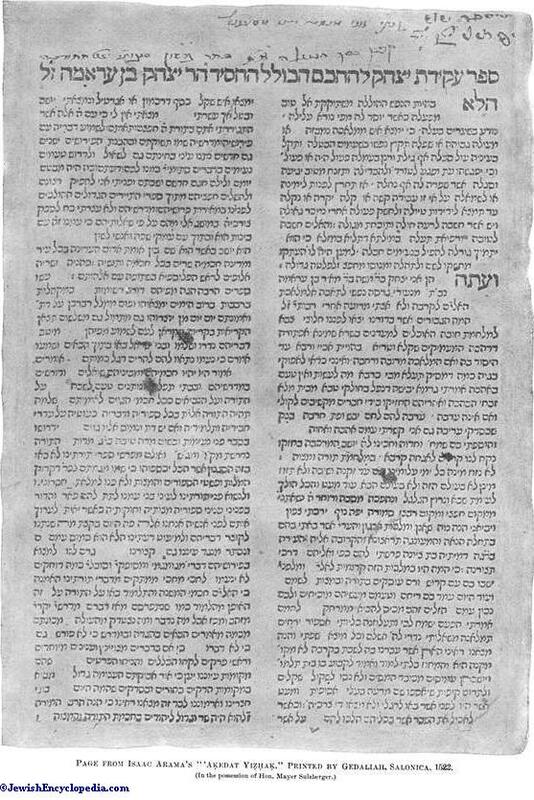 Page from Isaac Arama's "'Aḳedat Yiẓḣaḳ," Printed by Gedaliah, Salonica, 1522. Gehazi is one of those who, denying the resurrection of the dead, have no portion in the world to come, but share the doom of Balaam, Doeg, and Ahithophel (Sanh. 90a). It was while on the way to Shunem with Elisha's staff that Gehazi proved himself to be a skeptic concerning the resurrection. He considered the whole procedure a joke (Pirḳe R. El. xxxiii. ), and instead of obeying the order not to address even one word to any passer-by, nor return any salutation, he asked derisively of those he met whether they believed the staff had the power to restore the dead to life. For this reason he failed. In other ways, too, Gehazi displayed a mean character, as, for instance, in his behavior to the Shunammite woman (Pirḳe R. El. xxxiii. ; Ber. 10b; Lev. R. xxiv. ; Yer. Yeb. ii. ; Sanh. xi. ); he drove away Elisha's disciples (Sanh. 107b); he possessed a magnet by which he lifted up the idol made by Jeroboam, so that it was seen between heaven and earth; he had "Yhwh" engraved on it, and in consequence the idol (a calf) pronounced the first two words of the Decalogue (ib.). When Naaman went to Elisha, the latter was studying the passage concerning the eight unclean "sheraẓim" (creeping things; comp. Shab. xiv. 1). Therefore when Gehazi returned after inducing Naaman to give him presents, Elisha, in his rebuke, enumerated eight precious things which Gehazi had taken, and told him that it was time for him to take the punishment prescribed for one who catches any of the eight sheraẓim, the punishment being in his case leprosy. The four lepers at the gate announcing Sennacherib's defeat were Gehazi and his three sons (Soṭ 47a). Nevertheless, Elisha is censured for having been too severe. He "thrust him away with both hands" instead of using one for that purpose and the other for drawing him toward himself (Yer. Sanh. 29b). Elisha went to Damascus to induce Gehazi to repent, but Gehazi refused, quoting his master's own teachings to the effect that a sinner who had led others into sin had no hope (Sanh. 107b; Soṭah 47a). Gehazi was interrupted in his conversation with the king because the praises of a holy man should not be sung by a sinner (Lev. R. xvi. 4). He had been disrespectful to his teacher, calling him by name (Sanh. 100a). His character is said to have been that of a man who, though learned, was jealous and avaricious, unchaste and a cynic (Yer. Sanh. xi. ).